The Llangernyw Yew ([ɬanˈgɛrnəu] ( listen)) is an ancient yew (Taxus baccata) in the village of Llangernyw, Conwy, North Wales. The tree is fragmented and its core part has been lost, leaving several enormous offshoots. The girth of the tree at the ground level is 10.75 m (35.3 ft). Split trunk section where the church oil tank was formerly located. This yew tree lives in the churchyard of St. Digain's Church in Llangernyw village. 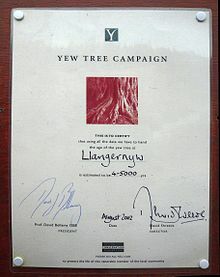 Although it is very hard to determine the age of yew trees, the churchyard gate holds a certificate from the Yew Tree Campaign in 2002, signed by David Bellamy, which states that "according to all the data we have to hand" the tree is dated to between 4,000 and 5,000 years old. There is an alternative theory that presumes the tree is only as old as the adjacent saint site, which would make it around 1,500 years old. In the mid-1990s the church oil tank stood in the space between the two trunk fragments; however, this was moved when it was realised that the tree was ancient. When this tank was built a lot of the dead wood was removed from the site which makes dating the age of the tree more difficult for dendrochronologists. In June 2002, the Tree Council, in celebration of the Golden Jubilee of Queen Elizabeth II designated the Llangernyw Yew tree one of the Fifty Great British trees in recognition of its place in national heritage. According to local tradition, the church of Llangernyw is inhabited by an ancient spirit known as Angelystor (the "Recording Angel" or "Evangelist" in Welsh). This tradition holds that every year at Halloween a booming voice foretells the names of parishioners who will die the following year. Folklore tells of a disbelieving local man, Siôn Ap Rhobert, who challenged the existence of the spirit one Halloween night only to hear his own name called out, followed by his death within the year. Certificate on the church gate. ^ Bevan-Jones 2004, p. 49. 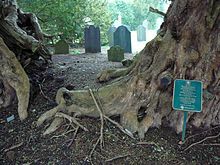 ^ "Llangernyw Yew the oldest tree in the world". relaxado. ^ Pughe 1832, p. 53. ^ Owen 1896, p. 170. Bevan-Jones, R. (2004). The Ancient Yew: a History of Taxus baccata. Bollington: Windgather Press. ISBN 0-9545575-3-0. Harte, J. (1996). "How old is that old yew?" At the Edge 4: 1–9. Available online. Kinmonth, F. (2006). "Ageing the yew – no core, no curve?" International Dendrology Society Yearbook 2005: 41–46. Pughe, W. O. (1832). A Dictionary of the Welsh Language, Vol. 1. Denbigh: Thomas Gee. Wikimedia Commons has media related to Llangernyw Yew. This page was last edited on 10 March 2019, at 09:01 (UTC).